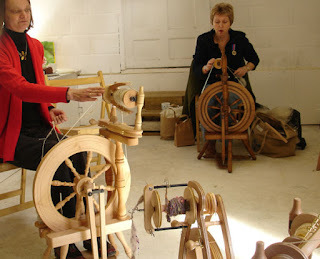 Easter Sunday saw our first North Norfolk sit and spin day. Five of us met in the beautiful setting of Alby Crafts and, well, sat and spun. Meg had the foresight to bring a drum carder which fascinated those who hadn't used one before and proved useful to others who'd spun the fibre they'd brought with them and needed to card some more! Meg cards amazing batts incorporating all sorts of chopped-up bits and pieces, which she then felts or spins. The day was a real success. I thoroughly enjoyed the day and loved seeing what others were doing. Everyone got on famously, and there was much exchanging of numbers and talk of meeting again.